"In May 2002 I flew over the coalfields of Kentucky and West Virginia. From the air, I came face to face with one, but only one, of the enormous costs we pay for our nation’s dependence on coal. Leveled mountains, devastated communities, wrecked economies and ruined lives—this is the coal truth. Half of our electricity comes from coal. In the Appalachian chain, ancient mountains are dismantled through a form of strip mining called mountaintop removal. We’re cutting down these historic landscapes—where Daniel Boone and Davy Crockett roamed and that are the source of America’s values and culture—with giant machines called draglines. These behemoths stand 22 stories, cost half a billion dollars, and practically dispense with the need for human labor. Join over 30,000 others who are standing up against this heinous act against the environment. I love my bike. 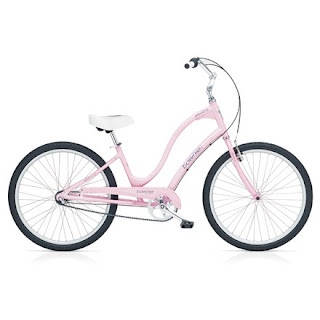 It's comfy, pink, and lovely. But I feel I've been neglecting my pedal-powered friend. One reason: I take the subway to work and walk everywhere in my neighborhood, so there's really no need to ride it except for exercise. Maybe I'm a bit timid when it comes to traversing thoroughfares like Flatbush Ave, or a bit skittish around those double-parked Fresh Direct delivery trucks that like to take up a whole lane on a narrow street. When I'm planning my route, I also like to know there's a bike lane and that I'm riding with traffic to avoid a head-on collision with a bike messenger. Well, I've just been tipped off (thanks, Ideal Bite!) about a site that takes all the guesswork out of planning your bike route: Ride the City. Like any other map site, enter your starting point and destination -- then Ride the City plans your route based on your specifications. You can choose between safest route (like me), safe route, or most direct route. I think this beta site may still have some glitches, because when I tried to find the safest route from my apartment in Brooklyn to the office in Manhattan, it did not compute. Kinks aside, like HopStop, I'm sure Ride the City will be another indispensable tool for navigating the urban jungle. Maybe you've heard of dry shampoos, a way to clean hair or at least fake it in between washings. In the past, women might throw some cornstarch-based product in their hair, comb it out, and call it day. While this method worked for some, it was more like masking the appearance of dirty hair rather than actually cleaning it. Apparently there's a more effective way to wash hair without water. 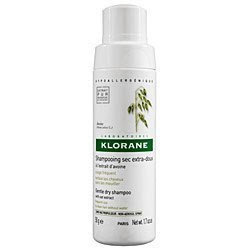 One such product is Klorane Gentle Dry Shampoo -- and they've just come out with a non-aerosol version. Great for travel, going out after the gym, or when you're just in a rush, this dry shampoo is one of those secret weapons of stylists at fashion shows or film sets. Since I'm always looking for ways to save water and wash my hair sans toxins, I'm just going to have to try it. Get yours here. Eco bonus: Pierre Fabre, creator of the Klorane Institute, has long been a supporter of plant biodiversity, through research of botanicals for cosmetic and therapeutic applications.